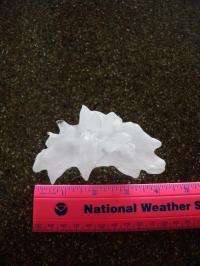 (PhysOrg.com) -- A March 9 thunderstorm that struck the island of Oahu produced unusually large hailstones, one of which measured over four inches long, a record for the state which rarely sees hail at all. The hail was the result of a rare supercell thunderstorm forming which produced both hail and one small tornado, another rare event for Hawaii. Supercells are a type of thunderstorm common in the central plains of the United States, but almost unheard of in Hawaii, where the previous hail size record was only around an inch. To produce such large sized hailstones a storm must have a lot of warm moist air rising up into much colder and drier air. And at the same time, the storm must produce winds that change direction a lot at the mid and lower levels, producing a lot of energy which results in strong updrafts. Such conditions cause moisture to be pushed up into the colder air where it freezes and starts to fall due to its increased weight. But because of the strong updraft, its pushed upwards once again where more moisture freezes onto its surface, causing the hail to grow bigger in size. This process continues until the hailstones grow large and heavy enough to fall through the strong updraft. Thus, the stronger the updraft, the larger the hailstones will grow. Supercells striking Hawaii are rare because the conditions for creating them arent conducive to such storms. While there is generally a lot of warm moist air in the lower atmosphere, there is seldom the kind of air movement that causes updrafts due to prevailing winds pushing storms along, preventing them from stalling, which can lead to the multidirectional wind shifts and then updrafts. And while there is no real evidence to suggest that the large hail in Hawaii is linked to global warming, there will undoubtedly be some who tie such a rare storm to other rare weather events that have been taking place all over the planet in recent years. Records for Hawaiian weather go back only as far as 1950, but since that time, hail of penny or quarter size has been reported just eight times, highlighting just how rare it is for hail to land on the island and how odd it is for hail of such a large size to be seen.